This is a replica of a 19th century pestle and mortar. The pestle and mortar were a key part of the pharmacist's equipment in the 19th century chemist shop. The pharmacist would put lumpy pieces of minerals or clumps of dried herbs in the mortar and grind them up with the pestle to a fine powder. The individual ingredients could then be mixed together and put into sachets for the patient's use. The pestle could also 'bruise' roots so that it was easy to extract the important and active ingredient. The herbs and roots could then be used for poultices, ointments or in medicines to be taken orally or internally. 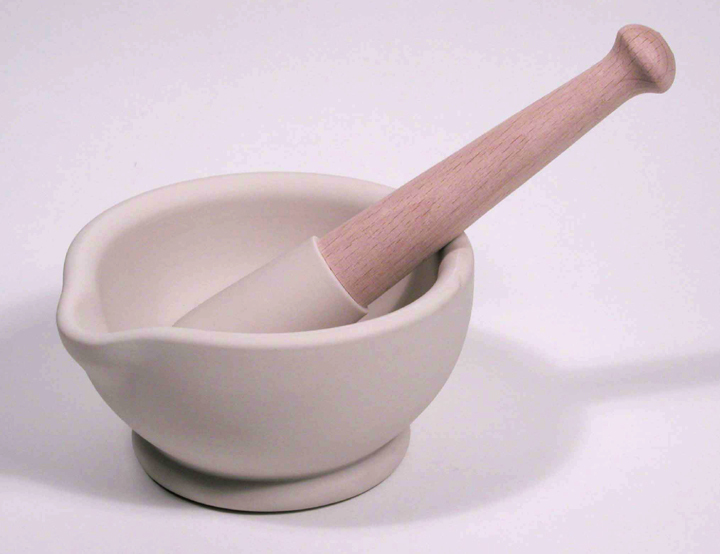 This pestle and mortar is made of unglazed porcelain and wood. Porcelain is a good material for a pestle and mortar because it does not react with the acids used in making medicines. Also, it is so smooth that no particles wear away when the medicines are ground up. Victorian pestles and mortars were made from many different materials - bell metal, brass, iron, glass, ivory or wood. But metal mortars would react with the chemicals, while particles of stone, ivory and wood mortars would wear away during grinding to contaminate the mixture. Josiah Wedgwood solved the problem when he made this tough pottery known as biscuit porcelain. This pestle is single-ended. This means that only one end is suitable for grinding and the other (wooden) end is the handle. Sometimes pestles can be double-ended. Many 19th century mortars were cup-shaped like this one. There were other shapes such as mortars with a nipped in waist, or tapered towards the base like an inverted cone. Made by the company Milton Brook. Size 2 (85mm x 116mm). Holds volume of 1/2 pint, 284ml. The pestle and mortar is a traditional apothecary symbol and at various times it has been used as a sign for a chemist's shop or pharmacy. In the Victorian era, a large replica - made of wood and painted or gilded - made a good outdoor sign to attract customers and distinguish it from other shops. Pharmacists made up herbal medicines following the directions from a book containing a list of medicinal drugs, with details of their formulae, methods of preparation and dosages. This book was generally known as a pharmacopoeia, and chemists either devised their own, or followed those written by eminent scientists of the time. The pestle and mortar were used in the first stages of making up a medicine. The pharmacist would use a range of equipment at each stage of preparing medicines. In addition to the pestle and mortar he would use scales, measures, scoops, powder folder, pill-making machine and spatula. The pharmacist would measure the ingredients carefully on the balancing scales, either in their natural state or after grinding them with the pestle and mortar. The final mixing was done on a white sheet of paper with a spatula. The bulk of the powder was then divided into individual doses and wrapped by hand in sheets of pre-cut paper. Folding was done using a powder folder - a tool that enabled the even folding of the doses so that they would fit snugly into the customer's pillbox. Powders often had an unpleasant taste. This could be overcome by mixing them with liquorice powder and liquid glucose and making them into pills. Another way of disguising the taste was to place the powders between two pieces of rice paper. The edges were moistened and stuck together. When a person placed the rice paper on the tongue it would become soft and the entire wafer could be swallowed. The rice paper changed shape later when they were made into tiny soup plates with the powder in the middle. They were called cachets and looked like Flying Saucer sweets. The pestle and mortar has a long history. They were probably a development of the grinding tools first used for corns and seeds as food by agricultural settlers in Neolithic times. There is evidence of the Greeks using them for medicines and in cooking. The preparations of many Anglo-Saxon medical concoctions called for the use of mortars - usually marble or limestone, iron or bronze. Stone mortars were used in the 16th century for powdering seeds such as coriander, cumin and mustard, herbs like thyme and for grinding the fragments of sugar cut from solid sugar cones or loaves. Bell mortars in the 17th century were cast from scrap metal left over from bell founding. This was a mixture of copper and tin and the mortar was the shape of an upside-down bell, which gave a good ringing tone. Sometimes they were given as wedding presents, with the names of the husband and wife and sentiments such as 'AMOR VINCIT OMNIA' (Love Conquers All) engraved or embossed on the surface. Anglo-Saxons - the Germanic tribes that settled in Britain from the 5th century AD. The name given to medicines taken in the form of rice paper around a powder. A specific quantity of medicine taken at one time. A cup-shaped receptacle made of hard material in which substances are pounded with a pestle. The period in Europe from 4000 to 2400BC when people used tools made of polished stone and flint, and lived by hunting and farming. A club-shaped instrument for pounding substances in a mortar. Person qualified to prepare and dispense drugs. A book containing a list of the drugs used in medicine, with details of their formulae, methods of preparation, dosages, standards of purity, etc. The preparation and dispensing of drugs (medicinal), or the pharmacist's shop - a dispensary. Utensil with a broad flat blade.